Vegan Easter is almost here! From the best vegan Easter eggs to buy and where to buy them, to budget gift making hacks and the vegan Easter recipes we’re loving here in the office! Say goodbye to those bland-free from Easter eggs of yesteryear and say hello to the new generation of Vegan Easter Treats! Dessert anyone? This one is for Londoners only i’m afraid! You really can’t go wrong with a Hummingbird Bakery cupcake! 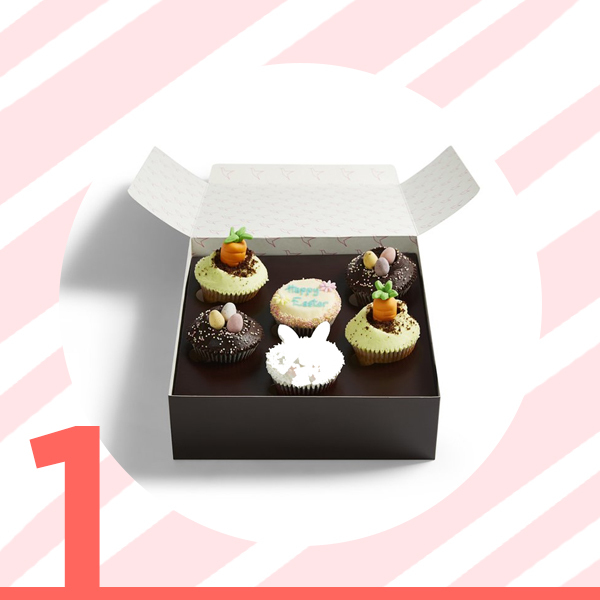 Be everyone’s favourite person by taking along a box of these seriously cute Easter themed cupcakes to your Easter gathering! These handcrafted chocolate slabs are different with every batch and would make a really great gift for someone! The toppings range from Party Rings, Biscoff and white chocolate to Oreos and Gingerbread! Pretty! Where from? Selfridges online or in-store. Get them something a bit special with this selection box from Artisan Chocolatiers Melt, available at Selfridges. Hazelnut praline anyone?! Where from? Fortnum and Masons, online and in-store. Looking for something a bit special? Treat someone this Easter to a Fortnum and Masons’ rich dark chocolate egg, blended with roasted Sicilian almonds. There are some little miniature choccies inside as an added treat! Where from? Goupie- online only. 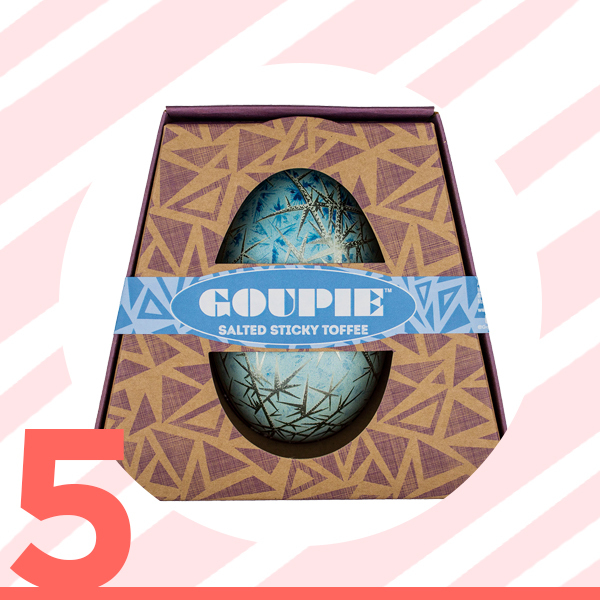 Goupie’s seriously delicious signature ‘salted sticky toffee’ chocolates inside a beautifully decorated tin egg. A nice added surprise is that the egg boxes come in 36 different designs and it’s a surprise which one you’ll receive! Described as a ‘cracking concept based on a soft-boiled splat’- this smooth dark chocolate egg features a smothering of yummy vegan white chocolate on top. It also comes in a biodegradable cellulose bag that’s compostable! Bonus! Where from? Sainsbury’s (in store and online) and various wholefood stores. Strapped for time? Smooth chocolate-y shells with a soft truffle-y centre, these chocolate truffle mini eggs are also gluten free and make the perfect little last minute prezzie! Where from? Online from Ocado, or find your nearest stockist here. Booja Booja is pretty respected in the vegan world for making some of the most drool-worthy chocolate truffles and ice creams available. These intricately hand painted papier mache easter eggs each contain mouthwatering truffles in flavours such as Almond and Sea Salt Caramel, Hazelnut Crunch and Fine de Champagne. While not cheap, this beautiful little box of fair trade cream eggs is a serious treat and we love to support independent businesses! Each of these oat milk and white chocolate ganache centre eggs are infused with either whiskey, spiced rum, French brandy, passion fruit, orange or coffee liqueurs. These eggs are rich, velvety and made with love! Who knew you could now get your favourite chocolate-y Easter tradition in vegan form?! This vegan chocolate Easter bunny is irresistibly smooth and creamy in texture just like their milk chocolate counterpart! These dark chocolate marshmallow stirrers are the perfect little pick me up! Simply pop into a mug of your favourite hot plant-based milk and stir! These babies melt like a dream! That’s our Sunday afternoon sorted. For something a little sweeter! This retro jar contains an assortment of sweets including Cherry Cola Bottles, Blue Raspberry Bonbons, Fizzy Strawberries, Rhubarb & Custards, Fruit Sherbets, Apple Laces and more! We all have that one friend who loves Lotus Biscoff a bit tooo much. This is for them. The Vurger Co. Top Tip- Don’t want to wait? Come along to The Vurger Co. Shoreditch and Canary Wharf to get your Biscoff Shake fix! And while you’re at it you might as well have some mac and cheese… it’s Easter after all! You can pick up so many dairy free chocolates in supermarkets these days and as a rule of thumb, a large majority of dark chocolate is naturally vegan! Just check the back for any dairy, eggs or whey protein! Just grab yourself some sort of container or basket from a charity shop and get filling it with all of your vegan finds! Try your hand at making your own vegan Cadbury’s Creme Eggs! This is one of our FAVOURITE vegan easter recipes! Try your hand at making some traditional hot cross buns to share! This is one of our favourite vegan easter recipes from Delightful Adventures. Why not bake and decorate some biscuits and give them out! These make perfect vegan easter desserts after that big old roast! Here are some of our favourite designs on Pinterest at the moment. Fancy treating yourself to something sweet this Easter? Get yourself down to The Vurger Co. and grab one of our infamously indulgent shakes! Choose from Oreo, Chocolate Hazelnut, Banana Caramel, Vanilla, Lotus Biscoff and Salted Caramel Popcorn! Want to drop someone a hint??! Share this page with them! Have a very sweet Easter everyone and remember to treat yourself!